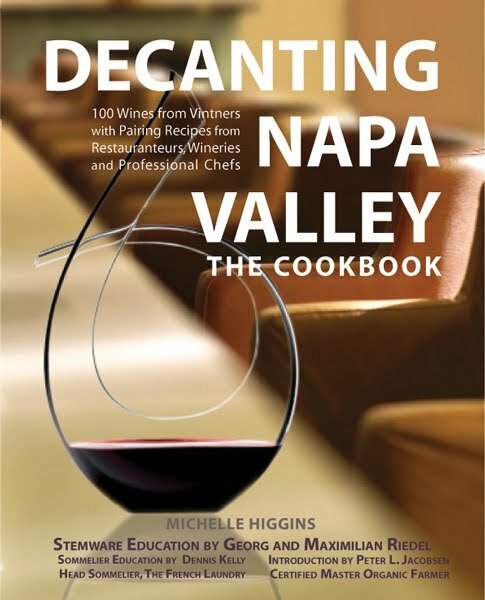 Book Review: "Decanting Napa Valley: The Cookbook"
Food and wine pairing is a tricky business; matching up recipes and wines is even more difficult. There are, of course, far more variables to take into consideration with the latter, not least of which are the vagaries and weaknesses of nonprofessional kitchens and the problems faced by recreational chefs all over America. After all, no matter how dedicated a home-practitioner one is to the culinary arts, there are certain ingredients that just will not be able to be sourced, or, if they are, the quality may not be up to the same level that a professional has access to. Wild salmon, fiddlehead ferns during their blink-of-an-eye season of availability, grass-fed beef, heritage-breed pork: These are among the items on a shopping dream list that, try as we might, not all home cooks can easily find. But that doesn't mean we shouldn’t strive, and it certainly doesn’t imply that, just because corners must sometimes be cut, we should simply give up on the idea of crafting the best possible matches for our standout bottles of wine. Paging through Decanting Napa Valley: The Cookbook (set for release on June 16th), you’re likely to come across a telling quote from famed importer Terry Thiese: “...wines which slide smoothly onto the palate and dance in sync with food are the wines which, paradoxically, have the most to say to us.” Few of us would be able to argue with his logic. And, indeed, the recipes in this excellent cookbook do just that: They help us mere cooking mortals make the most of our wines, and, often along the way, afford us the opportunity to surprise ourselves with just how easy it is to create a great wine-friendly dish on our own. They also give us a glimpse of who we are as American eaters in the early 21st century. The view from these pages, at least, is bright, indeed. With smart guidance and an open mind, in other words, it’s possible to eat and drink better than we likely thought possible. The recipe authors themselves form a who’s who of Napa Valley’s and America’s dining royalty, but don’t let that scare you. Because though we’ve all, at some point in our culinary lives, paged through cookbooks studded with recipes that looked about as easy and inviting as a decades-too-young Napa cabernet, the ones provided here are do-able. And while some ingredients may be a bit more exotic and therefore difficult to find--the cardamom and Vietnamese pepper, say, in La Toque Restaurant’s warm Maine lobster and roasted sweet potato salad recipe--they are available, especially these days, with just a bit of effort. The cooking techniques employed here, too, are generally accessible. This is in keeping with author Michelle Higgins’s note that these “recipes were developed by professional chefs for the ‘seasoned’ home chef.” So while this is certainly not a cookbook for the raw beginner, it is more than accessible to casual cooking enthusiasts with a bit of experience. And for wine lovers who haven’t cooked much in the past, this volume will work very well as an aspirational cookbook of sorts, as well as an excellent source of inspiration to page through while developing one’s cooking skills and deepening one’s repertory of techniques. But for me, the pairings constitute the key to this book. For while few home cooks will work their way through all of the recipes, Julie and Julia-style, the pure intelligence of the pairing suggestions will open eyes and broaden horizons on their own. White wine and pork, for example, are still not considered together nearly as much as they should be on these shores--it’s a sad hangover from the red-wine-with-meat-and-white-wine-with-fish mentality that weighed down American eaters for far too long. But the pairing of, say, the Fantesca chardonnay with a bacon-wrapped pork tenderloin, fava beans, onions, and a cider jus turns out to be a no-brainer, a tour de force of flavor and texture that highlights the ridiculousness of that antiquated (and so often incorrect) pairing orthodoxy. As for that photography, it’s as evocative and inspiring as in any cookbook I’ve seen recently. From glamour shots of the estates and vineyards, to the kind of glistening food close-ups that fans of the Food Network will recognize and find comfort in, to photos of the restaurants that provide an unexpected sense of context for the recipes themselves, Decanting Napa Valley is a pleasure to page through even when cooking a meal is not on the agenda. Skimming Food and Wine Magazine, for example, isn’t always about planning a meal, and sitting down with this hefty book doesn’t demand having a dinner party in your future: The pleasures here go far beyond the flavors themselves and bleed--happily--into the aesthetic, too. It is a tasty, evocative combination that’s rewarding on any number of levels, and a fitting homage to what is unquestionably one of America’s culinary jewels.